With March here, St Patrick’s day is not too far off and that is the perfect excuse to cook with some alcohol! One trick that I use to quickly caramelize onions is to add water to the pan which allows for more surface surface area to be in contact with the heat and it allows you to use a higher temperature. The last time I was caramelizing some onions I was thinking that instead of using water, why not use a beer or a wine and with St Patrick’s day on my mind a lot recently a nice dark Irish stout like Guinness seemed like the perfect way to go. 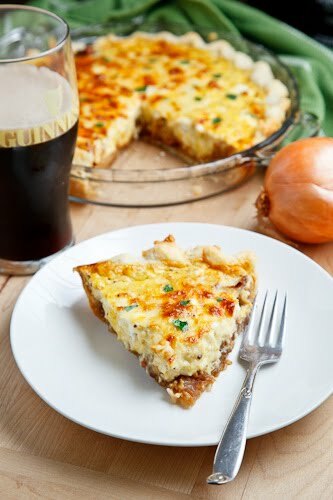 I was looking for an idea for brunch this past weekend and a Guinness braised onion and white cheddar quiche was sounding like it would hit the spot! In addition to the onions and cheese I really could not resist adding bacon to the quiche and from there I built up the flavours with some grainy mustard and Worcestershire sauce in addition to a bit of cayenne for heat. The Guinness braised onion and aged white cheddar quiche turned out amazingly well! 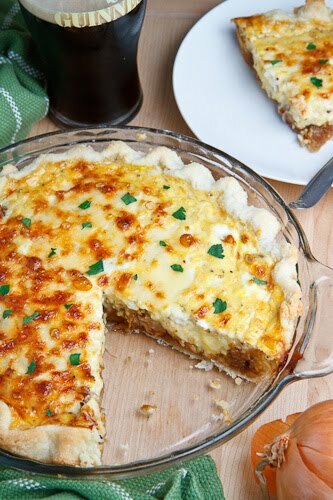 The sweet Guinness braised onions contrasted nicely with the sharp aged white cheddar and the rest of the flavours really played well together in the quiche. Feel free to enjoy a pint with your quiche! Cook the bacon in a pan oven medium heat until crispy and set aside on paper towels to drain reserving the grease in the pan. Add 1/4 cup Guinness and simmer until the liquid has mostly evaporated, about 15 minutes and repeat. Remove from heat and mix in the grainy mustard and Worcestershire sauce and place in a large bowl. Mix the bacon, cream, eggs and 1/2 of the cheese and season with cayenne, salt and pepper. Pour the mixtures in to the pie crust and top with the remaining cheese. Bake in a preheated 375F/190C oven until golden brown on top and set in the center, about 25-30 minutes. Looking for more St Patrick’s Day recipes? Sounds great. Guinness is always good for me. Did you use Stout or Draught? You have outdone yourself with this one. Every single ingredient is on my 'favorite foods' list. Cannot wait to make this. Thanks. Caramelizing onions in Guinness. You just might be a genius, Kevin! This quiche is fabulous! The flavors are just awesome. I bought some guinness to bake with this past week and now I have some leftover…PERFECT timing! This looks SO appetising. Caramelising onions is one of my favourite ever kitchen tasks – I love them with goat's cheese and rocket, but this quiche sounds like it could be even better! Oooh this looks and sounds so good! Does much of the Guinness flavour remain after cooking or are you mostly just left with the rich savoury-ness? I did a big post about French onion soup a while back, trying lots of different boozes, but it hadn't even occurred to me to try Guinness but I can see it would work so well with the onions! Wow. WOW! Just reading the description makes me drool. I never would have thought that I can caramelize onions with some stout! Perfect! I love quiche and yours looks so tasty, Kevin. I stumbled upon your blog via foodgawker and I am a new fan! Keep up the amazing recipes and pics. You have inspired me to make time to cook again! hanseata: I went with the Draught. I love the rich in depth flavours in this! Where is my fork! Emma: You do get some of the Guinness flavour coming through. I also enjoy experimenting with various forms of alcohol in French onion soups. I love this combo. Putting it on my "to do" list! Oh, yeah, that looks amazing! I think I'll try adding some blue cheese in there, too. I've never tried using beer or wine to carmelize onions…now I've got a new culinary move. Thanks! oh wow – I love guinness. It has such a rich flavour that does taste great in many things. Never thought of using it to braise onions for a quiche. Thanks for the info!! Okay I need to add you to my blogroll since I have run across you twice in one day- Pinterest and Tastespotting! This looks like a fabulous dish for the coming St. Pat's day! I just made this, and it was yummy! I used a coffee porter instead of Guninness and omitted the crust. I think the only thing that could improve it would be a nice handful of mushrooms. I'm currently eating your fantastic quiche with a homemade whole wheat crust. Results: day-um. 2 syllables. Thank you, and everyone? Try this now. Absolutely fantastic, people!!!! This is going to be the brunch feature the morning after my daughter's July wedding! Mini quiches will be perfect…..thank you from Waterloo Ontario! I made this without the bacon and used dijon mustard. Hands down the best quiche ever! do u think puff pastry would work in this recipe? in place of the pie crust? Made it last night and have to say we were disappointed. The mustard and worcestershire overwhelmed everything else. luvglass: With only 2 teaspoons of each in an entire quiche, they should not be overwhelming; they should add a nice subtle background hint. Is your grainy mustard extremely potent? Hi, I have never made a quiche before but want to attempt this. If I were to use a mini muffin pan instead (no crust), would it cook at the same temperature for the same amount of time? Anonymous: Cook it at the same temperature but take a look at it earlier, say 15 minutes, to see if it is done. You are a GENIUS, NO JOKE! OMG I am loving all the beer recipes!! Curious if you served this warm or cold? Also, if I wanted to make it in advance and warm it up for a party, at what temp and how long should I re-heat it? Hi Kevin, I love your recipes! 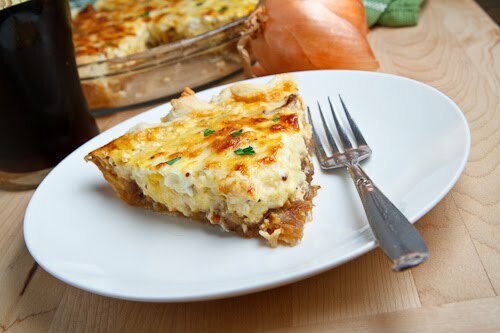 In the picture, the onions look as though they have been layered on the bottom and the egg mixture poured over, whereas in the recipe you say to mix them. Do the onions just sink to the bottom? I love how there is a layer of them in the photo. Amanda Dean: You can either mix them or layer them! You get a stronger hit of their flavour when you layer them and bit into that layer! Enjoy! Followed the directions exactly as written and it was gorgeous. The flavor combination is a winner! Served with a Boston lettuce salad with vinaigrette and it was a perfect dinner. Leftovers taste great too.